Which Foods Contain The Most Sulfur? Sulfur (sulphur) is one of the important mineral elements of the human body. As per the National Institutes of Health, sulfur is the 3rd most abundant mineral found in the human body (in terms of body weight). Sulfur (sulphur) is one of the important mineral elements of the human body. As per the National Institutes of Health, sulfur is the 3rd most abundant mineral found in the human body (in terms of body weight). It is found in all cells, especially in the skin, hair, and nails. A regular and protein-rich diet that consists of seafood, eggs, dairy products, meat and meat products, and nuts may make-up for the body’s requirement of nutritional sulfur. Water could also be a potential source of sulfur in some cases. Sulfur is indispensable to a few amino acids found in the body, which are responsible for various biochemical reactions and syntheses of proteins. Many enzyme activities and biological processes are dependent on sulfur, without which various metabolic functions may suffer. Sulfur is present in keratin, which is a main structural component of the skin, hair, and nails. Every cell uses oxygen for its function and biochemical processes; this cellular respiration is enabled through sulfur-contained amino acids. 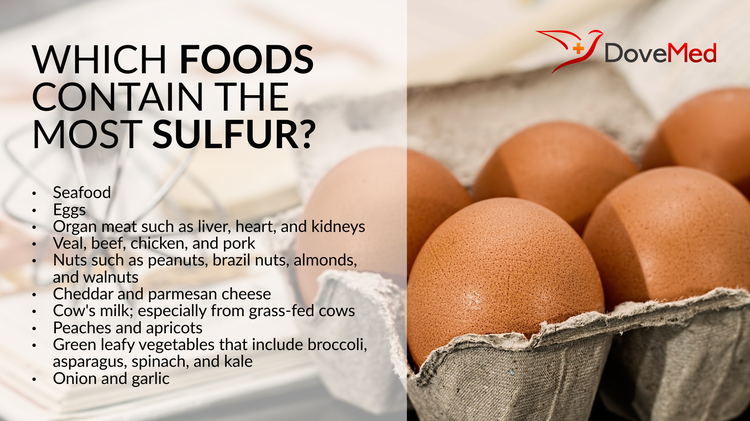 Sulfur also plays the role of a detoxifying agent by removing certain toxic substances, like drugs, from the body. Other helath benefits of sulfur include enabling healthy joints through the formation of healthy connective tissues such as cartilage and ligaments. Hence, sulfur is also used in the treatment of arthritis that involves the joints. The US National Academy of Sciences Food and Nutrition Board, does not prescribe a recommended dietary allowance (RDA) for sulfur. Generally sulfur-deficient states do not arise, and most of our body’s sulfur requirement is met through a well-balanced diet that we consume. Low levels of sulfur may occur in regions where the soil is poor in sulfur. Also, having a diet that is protein-poor and eating low sulfur foods may lead to a sulfur deficient condition. But, it is always recommended to take the advice of a suitable healthcare professional before bringing about any alteration to your regular food habits and diet. Ellis, D. R., & Salt, D. E. (2003). Plants, selenium and human health.Current opinion in plant biology, 6(3), 273-279. Shrikhande, A. J. (2000). Wine by-products with health benefits. Food Research International, 33(6), 469-474.